I am a pretty good printer, but I am a bit jealous of those who are artistic and can create and print their own work. I am mechanical and not artistic. 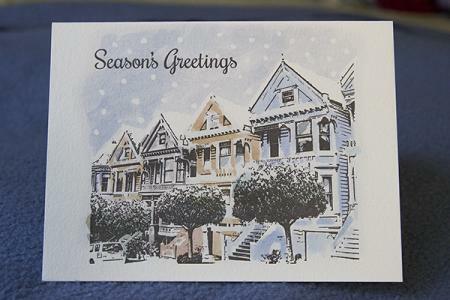 The holiday season will soon be here and those who can will probably create their own cards for Kwanza, Chanukah or Christmas. Maybe a Chrishanza card to cover all. I think it would be nice to see what our fellow printers have created and printed. If you don’t have this years work yet done, perhaps a picture from a previous year. I invite Show and Tell. Last year’s card for a family member. 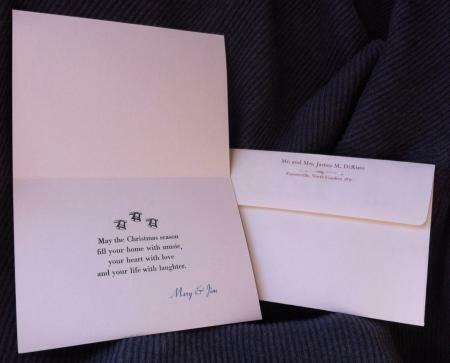 Of course the the inside of the card read ‘and may your days be merry and bright’. This is my first posting here. 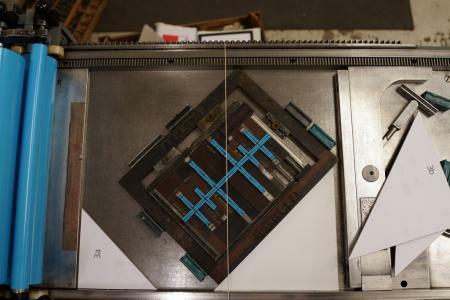 I’ve been an avid visitor of Briar Press for years and just recently signed-up. So first of all, hello! I’m really glad to be here. 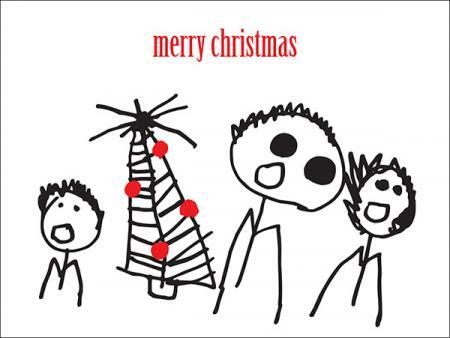 This is the artwork for the front of our 2011 Christmas card. Our son Oliver, who was 5 at the time, did the illustration and I printed it in 2 passes using black and 032 red. The person with the biggest head is me. Also shown in this photo-realistic rendering is my wife Marisa and the young artist, Oliver. I used my own homemade press which I refer to as the Studio-Platen six nine. It’s a very powerful and useful little beast and I’ll do a detailed exposé in the coming weeks. We have yet to design a card for this holiday season but when (if) it’s done, I’ll post that one too. I fully realize that my example is not likely to inspire someone who is looking for a more traditional letterpress look, but hey, kid’s art is often truthful, uninfluenced and endearing; it translates to the printed piece in a fun way. 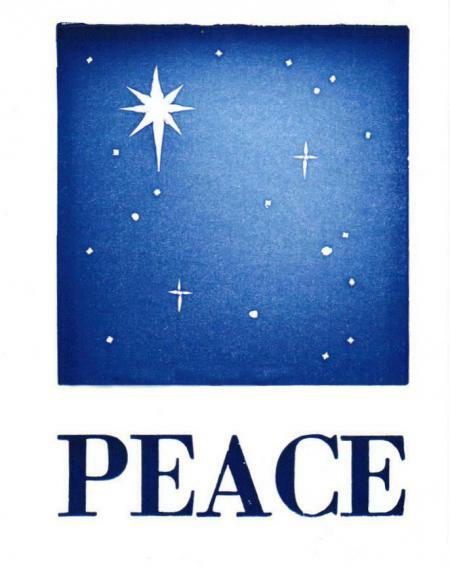 Besides that, he’s the only one in our family that came up with a decent Christmas card idea that year! I usually do a New Year’s themed postcard instead of something holiday-specific. Here’s my card from 2013. 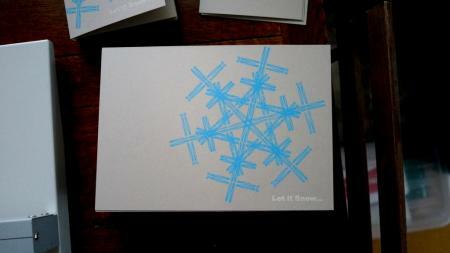 First up is the 2011 holiday card. 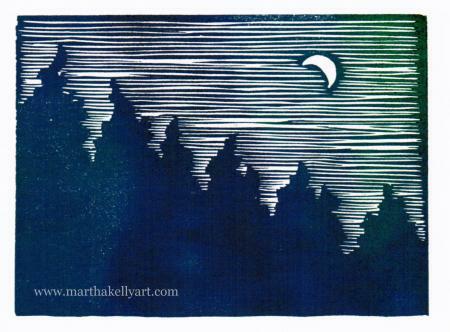 This was the very first thing I ever printed letterpress as I’d bought my press in October of that year. Set in metal type and cuts, printed on some random parchment-style paper (probably French Paper Parch-Tone) and sized to fold to fit in an A7 envelope. 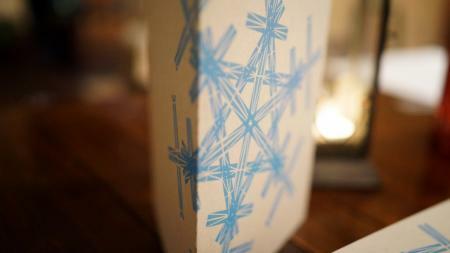 Here’s the 2012 holiday card, done entirely from metal type and cuts on Mohawk Via Cyan and sized to fit in a #10 envelope. I don’t have any shots of last year’s card as it didn’t turn out as well as I would have liked. I suppose I should post it, just for completeness’ sake, but I haven’t gotten around to it yet. These were designed by me, but printed by a good friend Evgeny in Moscow, on a Korrex proofer. Inspired by traditional slavic embroidery motiefs. Wow, Oprion. That’s amazing. Congratulations. 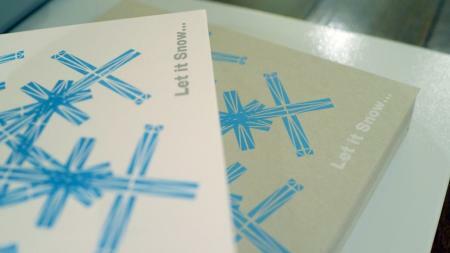 Here’s my effort from the UK letterpress Christmas card exchange from last year. 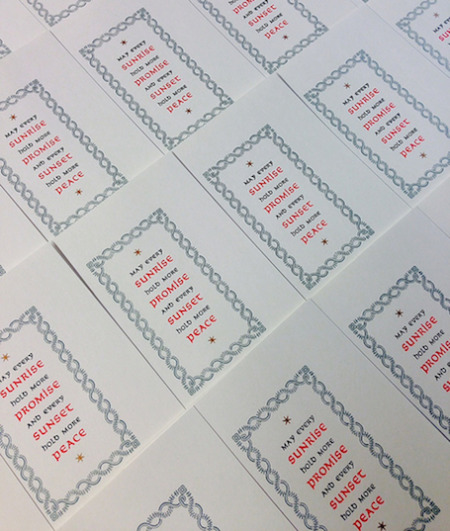 Around 20 printers swapped cards in 2013 - a great way to be sent inspiration and to get to know like minded folk. It’s always great being so popular at Christmas, too! There is still time to sign up for this year if anyone wishes to join… Feel free to message me for details. You already saw mine haha but here it is! 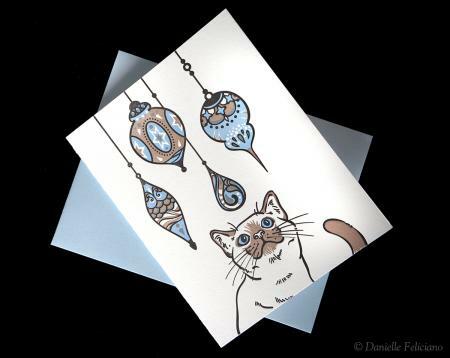 Every year I give in and do a kitten themed holiday card haha. This is this years - three color with some overprinting. 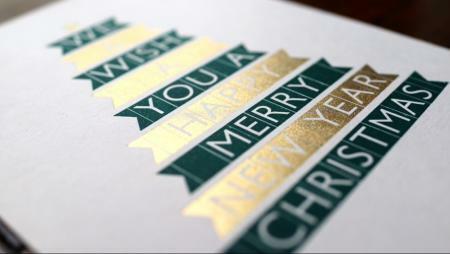 The most elaborate one I’ve done is written up on my blog (www.918printery.com) titled “Yearly Christmas Card”. I love looking at everyone’s cards. Thanks so much for posting! I don’t know when I’ll get our 2014 card printed — too many other things going on right now. 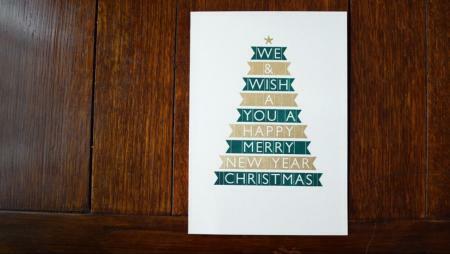 But here’s our card for 2013. Happy holidays! Just did the write up for this years cards. I’m even amazed at how they came out. Photos just don’t do them justice. Check it out. I haven’t thought much about this year’s cards yet. 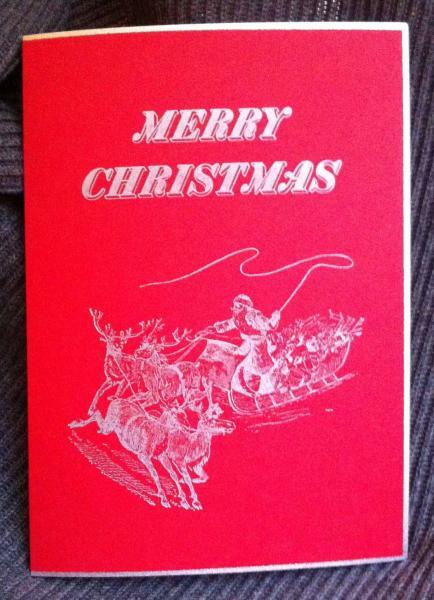 I didn’t do anything creative typographically, but I used some really nice Wild Cherry/Silver Pop-Tone bordered A7 cards and printed in silver ink an old engraving of “Merry Christmas” with Santa and his sleigh that Hodgins Engraving in Batavia, New York converted to magnesium cuts for me. 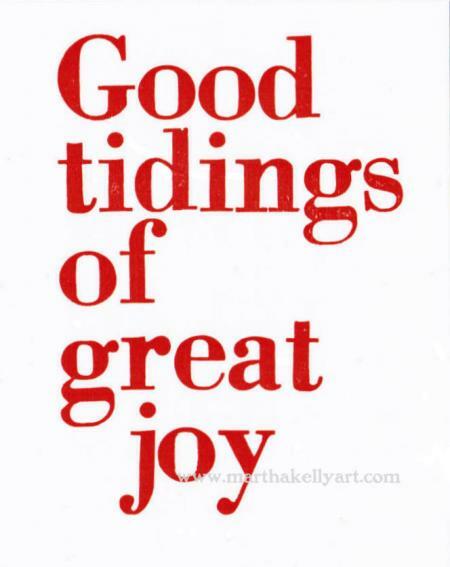 The inside text is 18 point Bodoni with an ornament and a signature line in 36 point Trafton Script. 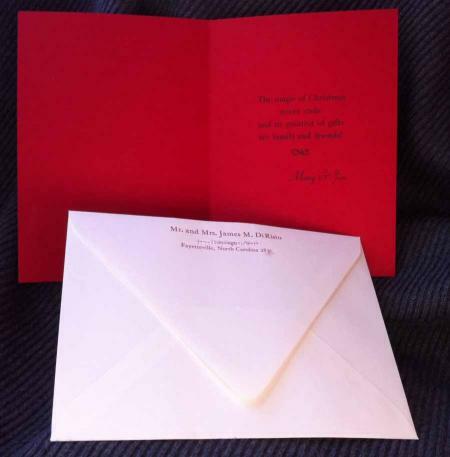 The envelope is a simple ivory with return address on the back flap. 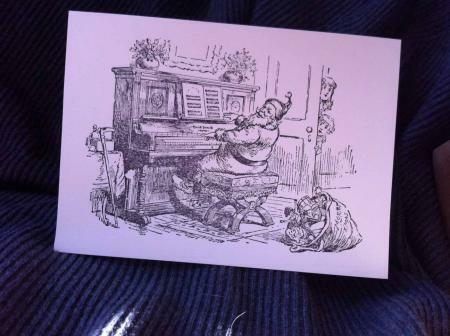 The second Norlu Press Christmas card this year is built again around an old Christmas engraving converted to a magnesium cut by Hodgins Engraving in Batavia, New York. The front is just the cut, but with measurements of 6”x4.25”, this one really pushed the limits of my 7x11 Gordon Jobber. Inside text is 18 point Bodoni with the signature line in 36 point Trafton Script. 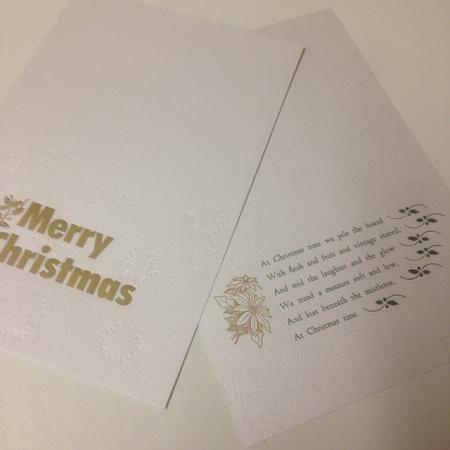 Three Christmas bell dingbats are arrayed above the text, and the cards are printed on Basis Natural A7+ 80LB cover. For the past while I’ve been experimenting…printing with found objects, mostly cheap trinkets, etc. found in thrift stores. This year’s holiday cards were made with some of these. 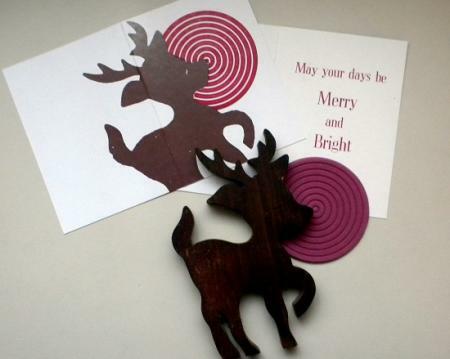 The reindeer is 3/4” pine; the nose and radiating red light is a plastic coaster, cut to fit around the head of the reindeer. Both items shimmed up with chipboard to type height. This year’s UK letterpress printers card exchange went international for the first time, with entries ranging from Mexico, USA, Iceland, Scandinavia and more. With over 40 printers involved, it was definitely a bumper year. Armina Ghazaryan (https://twitter.com/type_press) has taken some lovely photos of many of the entries.